The year 1864 would be marked by several important changes in Regina Shober Gray’s circle. The first was the announcement of Mrs. Gray’s friend Emily Adams’s unexpected engagement, which was soon followed by the death of an early Boston friend, Anna Powell Jones. 61 Bowdoin Street, Boston, Sunday, 3 January 1864: Every one is much surprised to [learn] of Emily Adams’ engagement to Caleb Curtis Jr. They have known each other all their lives, near neighbours and playmates from childhood – and have just discovered this penchant when she is 36 or 7 [sic] and he about a year younger. They know each other so well that each must be thoroughly aware what to expect from each other, in temper, character, intellect, & culture. So there can be little disappointment in that way. Sunday, 17 January 1864: Dr. Gray went on Thursday to a whist supper at Sam’l. Frothingham’s – and came home about 12 o’c., just in time to go with our neighbour, Mr. Wm. P. Lyman, over to see his little girl, ill of ulcerated sore throat, and under Dr. [Francis] Minot’s care; but he lives so far from them, that noticing some change in the child’s breathing, and fearing it portended croup, they sent for the nearest Dr. There was no croup however about it, and Dr. G. gave a sleeping draught and came away. Last evg. about 7½ they sent for him again in great alarm, but before he got there, the little one died. The disease proved to be diphtheria. A beautiful little girl, bright and sunny, a sad loss to them. We hear of a family at South End, who have lost 4 members in the last fortnight, of diphtheria; also that Meta Wilson, a friend of Mary [Gray]’s, a sweet girl, but very delicate and fragile, is alarmingly ill with it. It is a terrible scourge. How fast old friends drop off, as one glides on into middle life! So many dear and valued ones, “have done their long day’s work” for us and our love, for ever more! Wednesday, 20 January 1864: The shock of Miss Jones’s death oppresses me painfully. The more I try to realize it, the more the sense of loss grows & deepens – so valuable, so cordial, so genuine a friend, the blank left by the “retrieveless loss” of so much righteousness, sincerity, and warm affection will be broad and bare for many a long year to come. I went there this morning, intending to go afterwards to Mother G[ray]’s, Aunt Sarah B[radlee]’s &c, but found myself so overcome, that I hastened home, in no state to see any one. Soon the children came in, and began eagerly playing with soap bubbles, so excited with their beauty, so grieved at their fleeting span of gay existence – gone with a breath. I thought of the pale still peaceful face, over whose shut lips the bubble, breath, should float nevermore. Oh what a vain delusion it all seems, life, and its petty interests, its small ambitions, in face of this great stern reality, Death. Faith, hope, and charity alone can redeem our life from nothingness. Thursday, 21 January 1864: This sorrowful day we have seen the last on earth of our precious friend, Miss Jones; and I am sick with weeping, and choked with the sob at my heart for days. Indeed I am amazed myself to find how keen is the pain, how bare and blank the void made by the death of this strong-hearted, right-minded, true and loving friend. I had not realized before how many of the dear associations and close sympathies of my Boston home were more or less bound up with her warm friendship and genuine cordial intimacy. A rare woman, whose very eccentricities seem now more loveable than all the charms and graces of others. A friend, such as life does not often vouchsafe to any, faithful and true, earnest in sympathy, warm in affection, yet never blinded by it, untiring in devoted self-abnegation, sincere and genuine in every thought and word; one whose singular uprightness tolerated no subterfuge – whose clear insight laid bare as with Ithuriel’s spear all shams and false sentiment, putting them down with true thoughts and words as trenchant and clear pointed as that spear itself; one whose eager energies, wise counsel, and warm sympathies answered nobly to the claims of kinship and affection, and to whom the call of duty and benevolence never came unheeded or unwelcome. Her loss leaves a widespread sense of desolation and regret, which few of us are privileged to inspire. To me, and to many others, a light has gone out, which in its kind, life can never more restore – the onward journey will lack one element of cheer in her strong-hearted companionship, and be the darker for ever more. To her, this sudden summons, “Come up hither” could not be untimely to this truly righteous woman “The Lord’s appointment is his servant’s hour” – but oh, the loss to us! 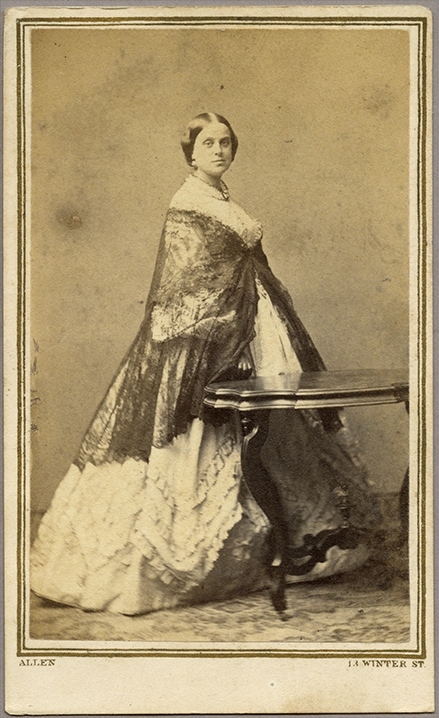 Emeline Matilda Adams (1823–1883), who married Caleb Agry Curtis on 13 January. She was 40 at the time of her marriage, and had lost her elder brother and father within the last few years. Samuel Frothingham (Jr.) (1815–1872) of 30 Chestnut Street. William Pratt Lyman (1828–1864), who married Abby Mauran Church Humphreys in 1855. The Lymans lived at 58 Bowdoin Street. Olivia Lyman (1858–1864); her sister Minnie died on 9 February. To Miss Jones’s house at 28 Chestnut Street. The diarist’s mother-in-law, Mary Clay (1790–1867), who was married to William Rufus Gray 1809–31. Sarah Fletcher Bradlee (1789–1866), the aunt of Mrs. Gray’s stepmother Lucy Bradlee Shober. In John Milton’s Paradise Lost (1667), Ithuriel (“discovery of God”) touches the disguised Satan with the tip of his spear and causes him to resume his real form. How wonderful to have these words about Miss Emily Adams’s unexpected engagement, which was soon followed by the death of Miss Anna Powell Jones. Although we all know intellectually that life has these almost balancing moments, the writing emotionally conveys the joy of one event and the deep sorrow of the other. The use of the courtesy titles above is very deliberate. Let us rejoice that Vita Brevis has given us so much satisfaction in 2016. Thank you, Rose — what a lovely compliment to Mrs. Gray and to Vita Brevis!